Secluded within it's own orchard with the sound of birdsong, croaking of frogs in the mill pond, scent of wild herbs and views southwards down the valley to the nearby vineyards and rolling hills of Burgundy. The massive medieval walls above of Flavigny- where the film "Chocolat" was shot - will draw you in to discover artists shops, restaurants and the ancient abbey where they still make the famous aniseed pastilles. This stunning 2 bedroom cottage of exceptional charm, entirely renovated to an exacting modern standard with considerable flair, will seduce you with it's atmospheric feeling of peace and contentement. The cottage is on 3 levels ; the attic twin bedroom has an old beamed ceiling with a roof window making it light and airy. There is a seperate toilet and washbasin making it ideal for children or adolescents. On the middle level there is a fully fitted kitchen with all modern appliances, eating area and sofa. On the lower level, that can be accessed by the oak ladder or by going outside, there is the double bedroom, an ensuite shower, toilet and washbasin and double doors that lead out to the terrace and garden. The garden has several mature fruit trees, help yourselves to make apple or cherry tarts, everything you need can be found in the house. There is an ensuite shower room with toilet with the double bedroom. There is a seperate toilet and basin for the attic twin bedroom. Towels are provided. We had a wonderful time in this idyllic location. The cottage is located down the hill from beautiful Flavigny and is so peaceful and quiet it's just perfect for a relaxing break. Louise is lovely and we can highly recommend her Beef Bourguignon on arrival. The property was lovely. Everything we had expected plus extras. The property was very well equipped and the environment was gorgeous. Everything we needed. No problems with the cottage at all. We were a little disappointed with the facilities in Flavigny. We had been told that there were 2 restaurants available and a bar/pub. When we got there we found out that both restaurants only opened at lunch time and there was definitely no bar. All very nice and quiet but not what I had been led to expect. Never mind we are resourceful and ate in every night which, because of the lovely weather etc was most enjoyable. Flexibility is the key word when doing self catering holidays we have found! Possibly later on in the year the one larger restaurant will be open in the evening. We went mid June which should have been O.K. and I had checked but hey ho. Overall an excellent place to stay for a week but do suggest the description on facilities in the village should be reviewed and expanded upon re dates of opening etc. This is a great little cottage in a beautiful setting. We stayed as a family of 3 + a dog. The cottage itself is small but well designed. It has a well kitted out kitchen and we cooked some great meals there. The stairs are more ladder like and would be difficult for anyone with mobility issues or small children but our 4 year old managed fine. The shower is great - plenty of hot water and powerful. We took the owner up on the offer of a meal and some local wine and it was a welcome sight when we arrived after a long journey. The food was great and we would recommend. My only disappointment was a note in the brochure when you arrive advising you are expected to clean the place in full prior to leaving or pay an additional fee. We did speak to the owner who advised that if we put everything away and swept up it would be ok and we received an e-mail reminder about this prior to departure. 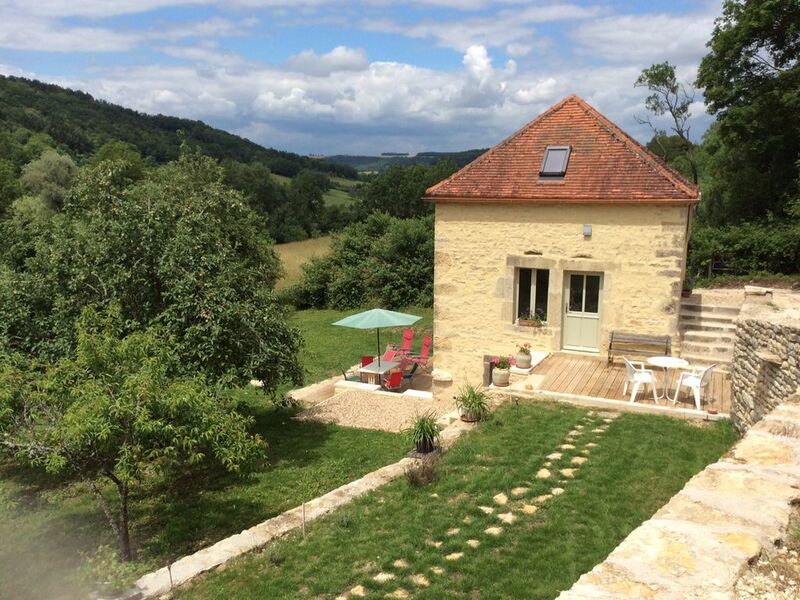 Can't say enough about Louise's place in Flavigny, truly a dream getaway. Stayed for two nights and didn't want to leave! Communication from Louise was timely and clear. As some of the other reviews have mentioned we opted for a meal prepared by Louise on the first night...delicious! The pictures hardly do it justice and only a short walk up the hill to quaint village of Flavigny. This is French country perfection! Would love to visit again! cottage is full of character and very well-equipped and clean. It is situated in a very peaceful location and it's an easy walk up to the village. We were very lucky with the weather (heatwave!) but the master bedroom, being on the ground floor, stayed lovely and cool. The area is beautiful and there's loads to do. The local vineyard down the road produces lovely wine and is very friendly. We will definitely be back. Thank you! There is a small grocery store in the village who have bread deliveries daily. Bed linens, towels and kitchen tea towels are provided for the stay. Payment can be made by bank transfer, cheque or cash, please ask for details. Minimum rental 1 night. Nightly prices are based on 2 people renting the property, extra people will be charged 20€ per person per night. Weekly prices are based on 2 people sharing, extra people will be charged 30€ per week Changeover day is negotiable but in July and August it is on Sunday.